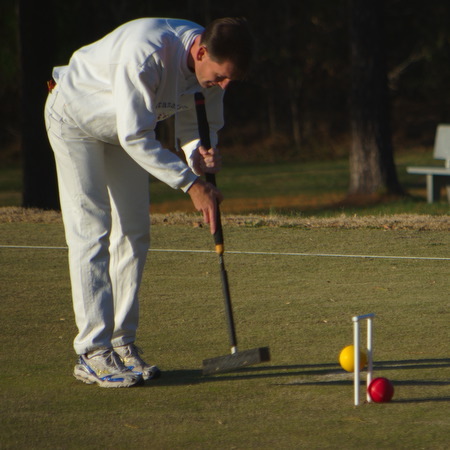 The 2008 Stoneridge Croquet Club Championship was held in chilly sunshine on November 23. Ten players participated in a seeded ladder. Tommy Harrington had won Stoneridge’s club title in 2007. But the tournament that year was handicap play, and fellow club members have needled Harrington that an asterisk ought to go next to his name on the club trophy. No more—this year’s club championship was level play, and Harrington knocked off Jeff Soo in the semi-finals. “Kiss my asterisk”, Harrington joked. Soo has won the club championship five times over the years. He is also the current USCA national champion, his fourth such title. But, except for 2002, he has never won both titles in the same calendar year. Neither has Paul Scott, Stoneridge member and two-time national champ. Nor Mack Penwell, Stoneridge founding member and 1993 national champ. Harrington’s win over Soo was not the only upset of the tournament. Eileen Soo scored her first-ever tournament win against Andy Short, another five a six-time Stoneridge club champion. Soo made a good start in her semi-final match against Paul Scott, but Scott eventually took control to close out the game. The finals started with an attack by Scott, which led to six-ball deadness when he failed 5 with red. Harrington managed the deadness well. Several turns later he had a four-ball break with black, but he misapproached penult and took position. Scott cleared red and joined mid-court, but Harrington hit in with blue to protect partner. This left him three-ball dead with blue, but black was able to clear penult and later rover. After some two-balling and tactical play, Scott attacked with red, trying to pick up a four-ball break. But he failed 1-back, again ending six-ball dead. Harrington used smart rover tactics to eventually set blue for a three-ball break, while keeping black clear. Playing blue, Harrington kept sending pioneers long, and this caught up to him at 2-back. With blue three-ball dead again, Scott attempted to get yellow clean. But when he stuffed 2, Harrington rushed blue to 2-back, took off to red in corner II, then sent red to 3-back and removed yellow from the hoop. Yellow could only corner, and blue started another break. But Harrington again sent pioneers long, and despite a good recovery and approach to penult, he missed from close range. Scott’s troubles weren’t over yet. A few turns later he rushed yellow to 1-back, splitting yellow to position at 2 while getting position at 1-back with red. But he failed the hoop, and then failed the jump with yellow. Harrington had cleared black in the meanwhile, but he put blue well out on the court to give black a rush, and this was enough of an opportunity for Scott. He scored 1-back with red, then rushed near blue and black on the north boundary. Sending yellow to 4-back, he roqueted black and sent it into the court while getting a rush on blue to 2-back. The rush went perfectly, and after a few more precise long rushes he had a four-ball break established. He pegged out black, and just as time ran out he was able to set yellow in very close position at 2 with a three-ball break set up. His break with yellow was equally precise, allowing him to win 26-23, for his third second Stoneridge title. Frank Thompson directed the tournament.